That was the message AL received from God many years ago. Of course, we quickly learned that it was Psalm 2:8. We began quoting it over and over to ourselves and we did begin to travel to the nations. We began to write strong, foundational, Spirit-filled materials for training. We were among the first ministries to go on the Internet still with one goal ~ reaching the world. Now, we have people from around 125 nations visiting us on the web each month. One powerful promise became our purpose, our goal, our desire. Now I have been to over 90 nations. Our teaching material is in 25 languages. Our teaching with the International School of Ministry (ISOM) is reaching over 140 nations. But we are not satisfied! There is still more to do! Now the Lord is speaking to us about His Church, the Church He said He would build. The Church that the gates of hell will not prevail against. What is God saying to his body of believers today? How do we reach the lost and dying of this generation both in our nations and the nations of the world. We have just spent two weeks in Hawaii ministering and praying about this. For many years we have been hearing and talking about the Seven Mountains of Influence. And then God began to speak about the Mountain of the Lord, the Eighth Mountain which is the presence of God the Father. In 1949 after the end of the Second World War, we remember as children the concern we felt around us as all missionaries were forced to leave China or put into concentration camps. They spoke at our churches telling of the horrible things they had witnessed. All the Christian leaders were being imprisoned, even killed. The curtain of Communism fell over the country and we heard no more. We thought the Church in China had been destroyed. But instead, when the curtain lifted, we found the Church was alive and thriving. There is no way to know for sure how many Christians there are today. A low estimate is 30 million, and even with that low estimate, that would mean the church exploded with a 40-fold increase! What happened? We are still looking for more answers to that question. I have had the privilege of graduating over 25,000 students from the ISOM training program in China. On Monday night, something happened while we were in Hawaii, that has us both so excited. Our friends in Hawaii have a large company in Orange County, California, as well as a smaller branch in Klanea, Hawaii. In their company, they have set aside a room for prayer 24/7 and also have another room which will seat close to 300 people. As we watched on the computer in Hawaii through security cameras, we experienced the awesome power of God being released as a group of intercessors met to pray for our country and however else the Lord led. Prayer is every night from 7 to 10 PM. As we worshipped, prayed, watched, God was whispering to us, “This is a prototype. Pay attention to what you are experiencing.” Truly God is moving back into the business world when we make a place for Him. And then, just to prove He is God and He is behind this move, on Tuesday with no special promotion, the sales for the company doubled! And this was on the slowest day of the week in their slowest season. 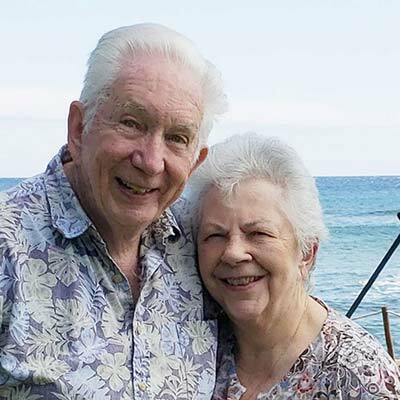 This couple are also in the process of remodeling a building for their business in Hawaii with a large room opened for prayer 24 hours a day, 7 days a week. There were many opportunities to minister healing including cancer and a brain tumor. Others were born again and filled with the Holy Spirit. One young man who had just accepted the Lord asked if I would baptize him. Of course, I was happy to do that. 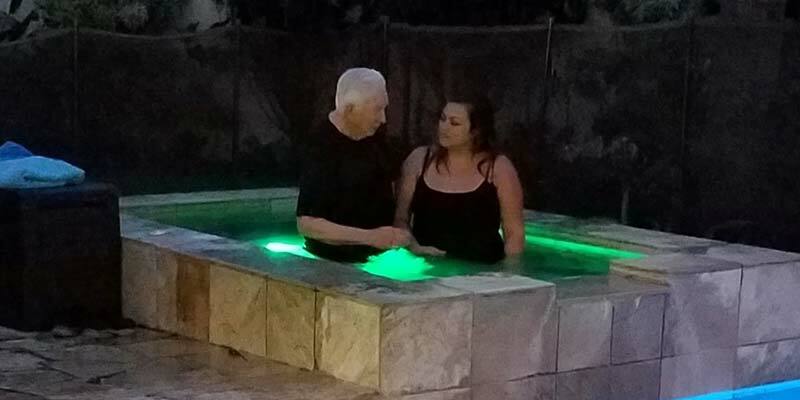 Then others wanted to be baptized and a family dinner turned into eight being baptized in the swimming pool at our friend’s home. Our dear friends, Jack and Grace Tuls, continue to go to nation after nation where God tells them to go, meeting with pastors and establishing “Kingdom Training Centers” using our training manuals that have been translated into many languages. Many others are discovering these resources on our website, all free of charge. It is good to be home for a week and this includes our monthly “Fire on The Mountain” revival meeting with Jerame Nelson and Andrew Hopkins. I will continue on the next day for four weeks of ministry in the nation of Malaysia while Joyce will be at home as she continues working on the upgrades of our resources and website. While in Malaysia, I will be doing meetings in four churches including the church and Bible School we helped start 35 years ago with our spiritual son and daughter, John and Hepsi Ezekiel. I will be doing a week of teaching in two other Bible Schools in that nation. The first week will be a week of teaching with a Burmese translator at a school started a number of years ago by Sarah Aye, one of our graduates at The School of Acts in Malaysia. After she graduated, she went into the community where many of those like herself, other refugees from Myanmar, are now living. She started winning these Burmese speaking people to Jesus. She started a church that now has around 2,000 in attendance and they are expecting around 3,000 in this year’s conference. She starts a new full-time Bible School every three months where I will be their week-long teacher again this year. Her brother, Joshua Aye (now one of our spiritual sons), serves as my interpreter and is an awesome worship leader. Last year, we trained hundreds of their young cell group leaders. These meetings began after they get off work at around 10 PM and go to around 3 AM in the morning. Most of them never sat down, but were leaping up and down shouting “Yes! Yes! Yes!” in Burmese as I ministered the powerful, life-changing truths of God’s Word. As I have done for the past twenty-five years, I will again be the opening week’s teacher of The School of Acts headed by Dr. Raymond Mooi, with students coming from many nations. I will again be teaching practical, life-changing foundational truths from God’s Word for both the day and night classes for the whole week after ministering at “HIS Church” on Sunday. floor under the power of God by the end of the evening. I love being the opening week’s teacher as I get to set the pace and move the students into the middle of the Book of Acts. A Pastor, Justin Monfort, from a powerful church in Ohio will be joining me for this year’s Malaysia trip. Two others, David Hanashiro from Hawaii and Ken Starr from California and Hawaii, will also be joining me for part of this trip. As always, we ask for your daily prayers for each one of us and for those that we will be ministering to in Malaysia. Please pray about what God would have you to do both as an extra special financial gift to help in sending us this month as your missionaries to the nation of Malaysia. And also, if you are not already a regular contributor, please pray about becoming a regular monthly partner to keep us on the front lines of this great end-time harvest. The cost for travel, developing and paying for the translations and making all of these resources available free of charge keeps stretching our faith. Millions are accessing these resources every year by individuals, churches and ministries in over 125 nations. Needless to say, we can’t do it alone. We do need your help. God bless you for your obedience to what God is telling you to do.